With the advent of SharePoint Framework (SPFx) the development has taken a massive traction towards client-side development. Angular, Knockout and React are the prime candidates when it comes to a client-side framework of choice. In this article, we will see how we can develop client-side webparts using Angular, Knockout and React. 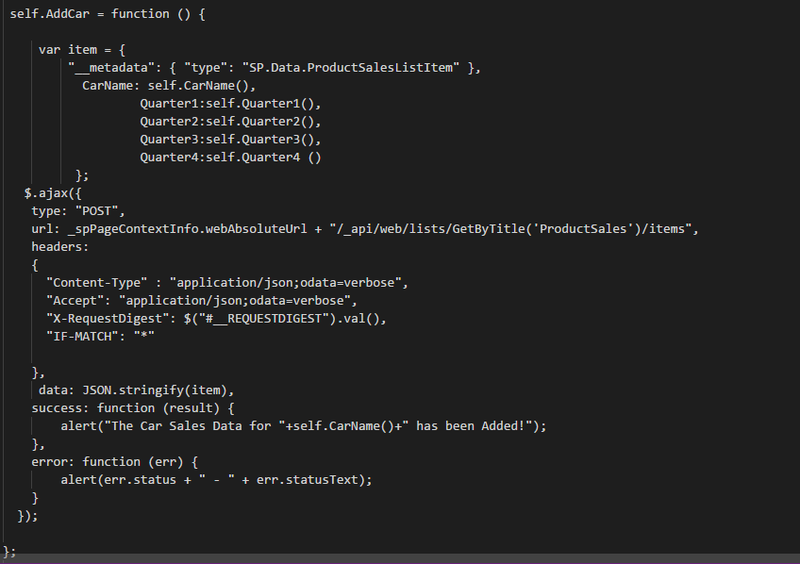 We will be primarily creating the webparts using the client side JS framework and REST API. The article is divided primarily into 3 sections. Implementing SharePoint CRUD functionality using Angular . Implementing SharePoint CRUD functionality using Knockout JS. Retrieve and Develop Client Side Grid Web part using REST API and React JS . As a bonus, we will also cover how to create client-side webpart using Kendo UI. 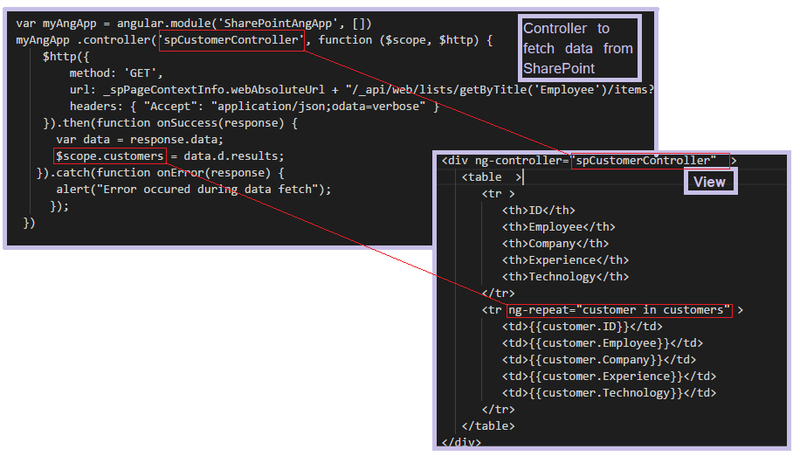 In the first section, we will see how to implement Angular Client Webparts for SharePoint. But To get started with Angular JS in SharePoint we will get to know some useful Angular terms. Angular Modules define the application. The Modules will contain Controllers that control the data flow. The module is created by using the AngularJS function angular.module. 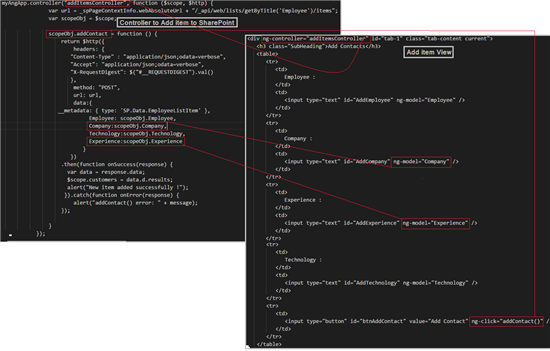 Thus mySPJourneyApp is the HTML Div element within which the angular app will be run. More examples can be tried out in the W3Schools Editor . 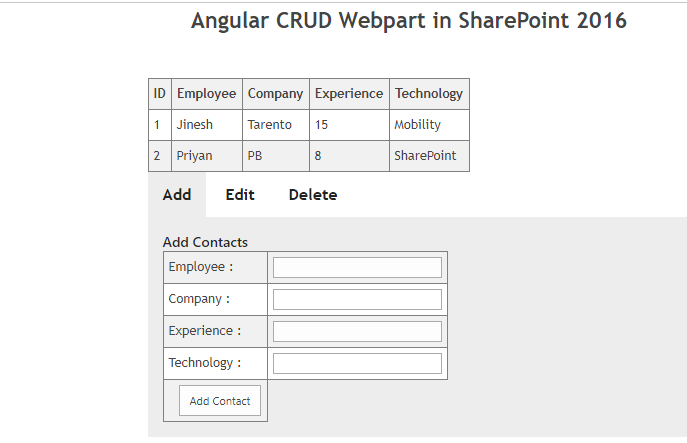 We will cover the CRUD functionality using Angular and SharePoint in the coming section. The view and controller sections interact with each other to achieve the data retrieval and display functionality. The view is defined as below using the div and the corresponding controller is mentioned in the div using the angular directive ng-controller=”ControllerName”. 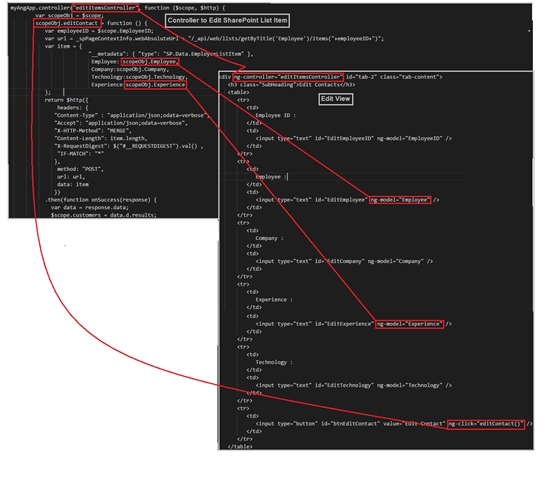 We will assign the retrieved values customers attribute of the $scope variable so that it get iterated and populated in the view as shown below. So as to add an item to SharePoint from the Angular View , we can define a POST method within the controller that will be invoked when we click on the Add Item button. The view of the Add Item section will look like below. The employee information fields will be defined using the angular directive ng-model, so that we can access these using the $scope object from the respective controller. The EditContact button has an ng-click directive that invokes the editContact() method defined in the controller. The controller is defined as shown below . We will be making use of the REST API that points to the Employee list. We will get the specific list item to be updated using the list item id in the REST URL. The delete button has the click event handler registered using the ng-click angular directive.this method will be defined within the delete controller as shown below. We will make use of the REST API to delete the specific list item. The connection between the Controller and the view for the delete list item is shown below. The employeeID to delete is accepted as input form the view using input text box and bound to the variable using the ng-model directive. We can use this id to create the Delete REST API url from within the controller by accessing it using the $scope variable. In the previous session, we saw how to work with Angular in SharePoint. Now let's see how we can implement Knockout webparts in SharePoint 2016. Observables are declared in the ViewModel and any property that is declared as Observable has the benefit of auto refresh. Ie: any modification to the property will automatically be reflected in all places the data is used. This way we will be declaring the carName as an Observable. We will be using the data-bind attribute to bind the value of the input text box to the view model. 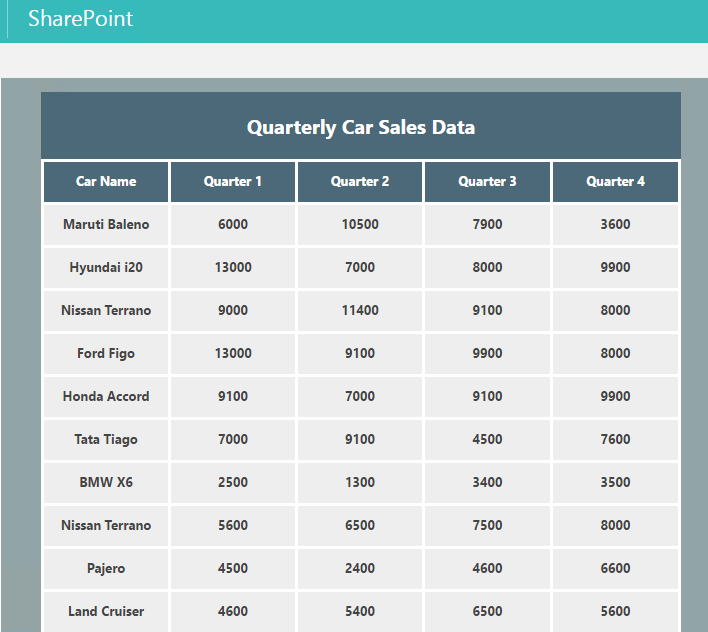 This will bind the value we input in the view to the View Model property, CarName. When the $(document).ready is called, It will first invoke the View Model. 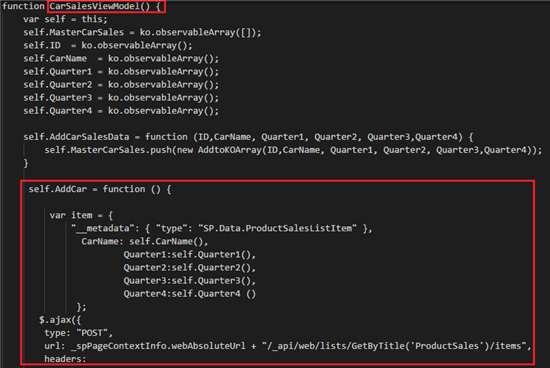 So we have to define all the Observable properties that we have to use within the code here. The View Model is now initialized and we can use the ko.applyBindings to activate knockout bypassing in the view model as the parameter. The below code block will act as the main starting point of the code. As we can see we are making use of REST API to get list data from ProductSales list in SharePoint. We will be issuing a simple Ajax GET request.The returned data is then iterated and data is pushed into the KO Observable array using the below statement. Within the view model below, we have the code that will push the above data into the Observable array. 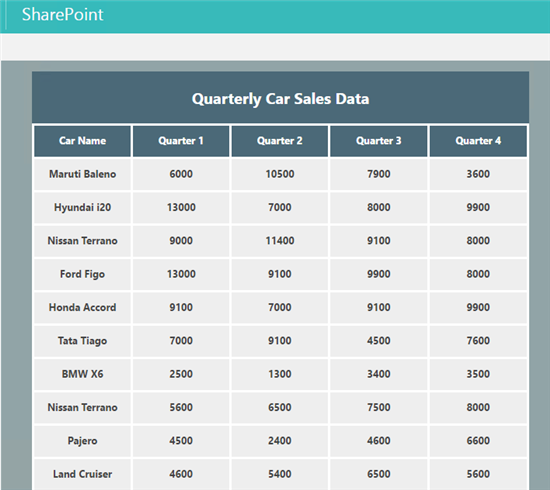 Here the data-bind attribute will assign the value we input into the variable CarName,Quarter1/2/3/4. We also have a button with an attached event receiver that invokes the AddCar() in the ViewController. Thus adding the data to SharePoint is relatively easy as we use the usual REST endpoint and pass in the data from the KO View using the Self object. 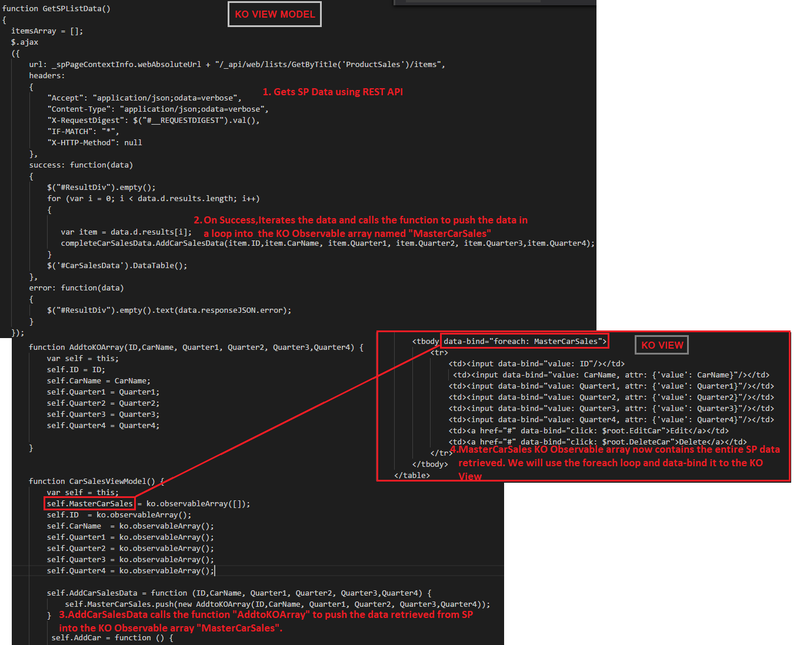 Here the data-bind attribute will assign the value we input into the attributes CarName,Quarter1/2/3/4. We also have a button with an attached event receiver that invoke the EditCar() in the View Model. Here the data-bind attribute has already bound the ID of list items to the ID attribute when the page loaded. We also have a button against each car record with an attached event receiver that invoke the DeleteCar() in the ViewController. 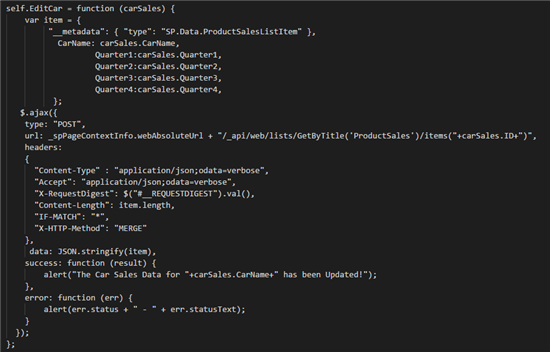 Once we have created the data payload, we will use the REST API URL to update the specific SharePoint list item and issue a Delete ajax call. This will delete the record from the SharePoint list. The below code has been tested in both SharePoint 2016 and SharePoint Online. React makes it easy to create interactive UIs. It helps us to create simple views for each state in our application, efficiently update and render the right components when our data changes. 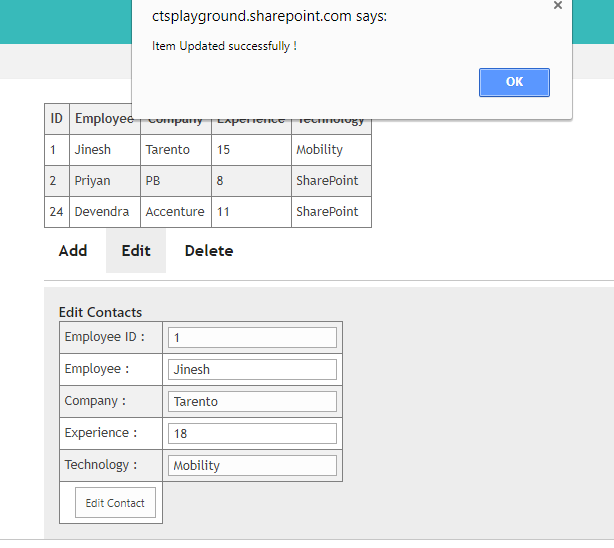 In this section, we will make use of React and REST API to retrieve list items from SharePoint and display them using Content Editor webpart. This will display the message at root div.In our case we will be displaying the data retrieved from 'ProductSales' list in the div named 'CarSalesData'. update this state with SharePoint data at a later point in the react lifecycle. If we don't have to initialize state and we are not binding any methods, we don't need to implement a constructor for our React component. Each component has several "lifecycle methods" that we can override to run code at a particular time of the process. Methods that are prefixed with 'will' are called just before some event happens, and methods prefixed with 'did' are called just after an event happens. 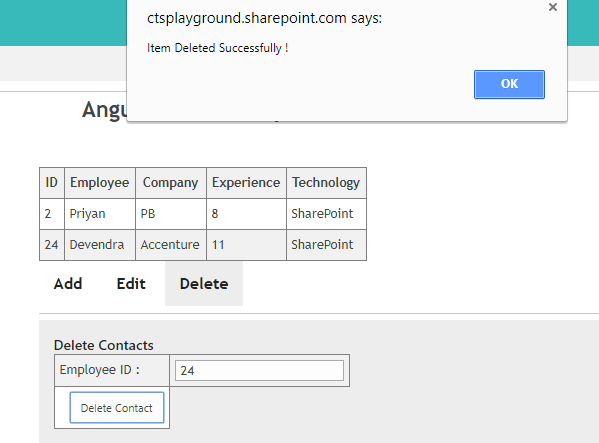 We will be making use of the 'componentDidMount' method to fetch data from SharePoint List and we will update the state with this data. In the render method, we will then read the state data and display it in the UI. The code can be saved as a text file and added to the Content Editor Webpart to display the grid webpart. Kendo UI provides with an advancaed grid library which can be used o create dnamic client web parts for SharePoint. Though it is a clien side library it is not a replacement to jquery or Angular/Knockout which was discussed in this article. Kendo UI is aimed at improving the productivity of client side development by using it along with jQuery. So as to populate the above div using Kendo UI Grid compoenent , we will invoke Kendo UI using the below call and pass in the required parameters. The data source is the main parameter that contains the URL to which we will issue a GET request. The URL and the type of response expected("application/json; odata=verbose") are specified within the read attribute. We can specify additional grouping,sorting and pagination in the below section. We will specify the SharePoint List column to Kendo grid mapping in the columns attribute section. 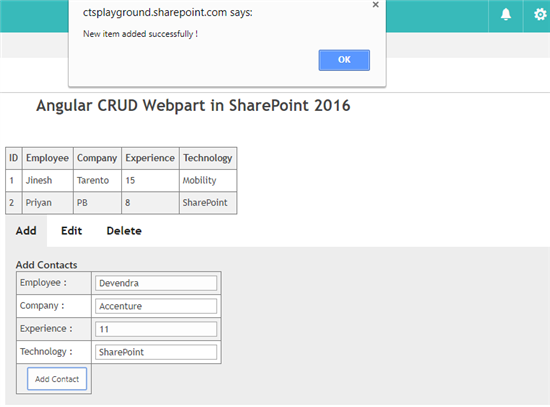 Thus we have seen how to implement client side webparts in SharePoint Server 2016 using React,Angular,Knockout and Kendo UI. We will see more examples in the coming article.